In a break from our usual posts, today we’re blogging about something we know you’ve all been secretly pining to know about but were too ashamed to ask. I’m talking about the title-wave that hit Florence the Summer of 2011 from the shores of New Jersey – Pauly D, Vinny, Mike the Situation, Ronnie, Sammi, Snooki, Jwoww, and Deena – the Jersey Shore. Love them or hate them (or maybe just love to hate them), these over-tanned juice heads fist pumped their way into America’s culture, and, much to the chagrin of the Italians, Florence’s as well. Fortunately, Meg and I shared the city with these super-sized personalities that fated summer and can now bring to you every spot in Florence that the reality stars christened with their fist-pumping, pizza-making, and Jersey drama. If you happened to miss this season of the ultimate culture clash filmed in Florence itself (or maybe you only watched it in secret and need a recap) let’s begin with a review. Gals get your hair teased and guys tie up your favorite pair of fresh sneakers because it’s time to take a walk, not in the footsteps of Michelangelo or Machiavelli, but the Jersey Shore in Florence. Let’s start off at the epicenter of the action – 6 Via Vecchietti, what the cast called home for their six weeks in the city. Centrally located, the meatballs were only a few stumbles away from Piazza del Duomo. To find the apartment exit the piazza on the southwest corner. Head west on Via Pecori. Take your second left on Via Vecchietti and find the address on your left within a few meters. 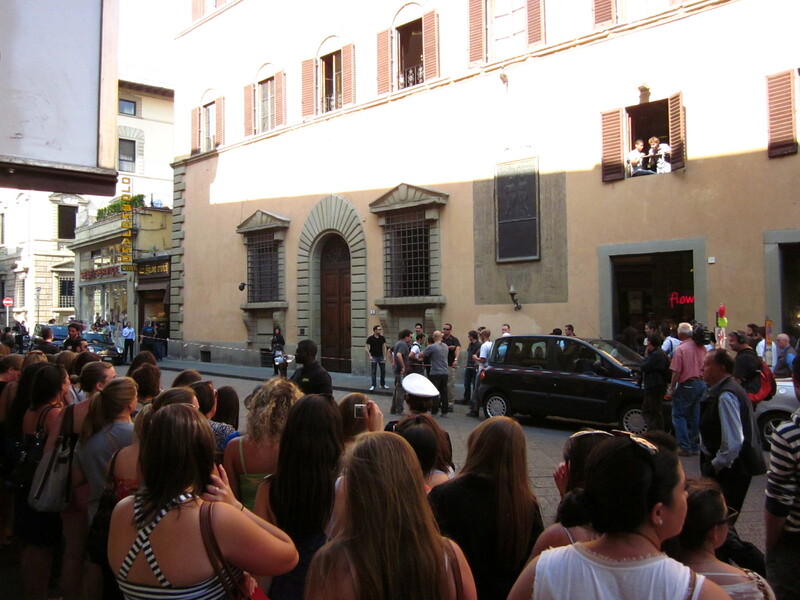 Although the building may be easy to stroll past now, when the show was filming the street was nearly impassable. Swarming outside of the apartment 24/7 was excessive security and peeping toms (definitely something Meg and I would never do….uh…right meg?) hoping for just a glimpse of the smushing, hair-teasing, wine-bottle throwing, and pranking taking place behind the shutters. Next stop, what puts the L in GTL of course! In almost every episode of season 4 some dramatic conversation takes place over the schlepping of laundry between the apartment and the Lavanderia Manfredi by the Mercato Centrale. 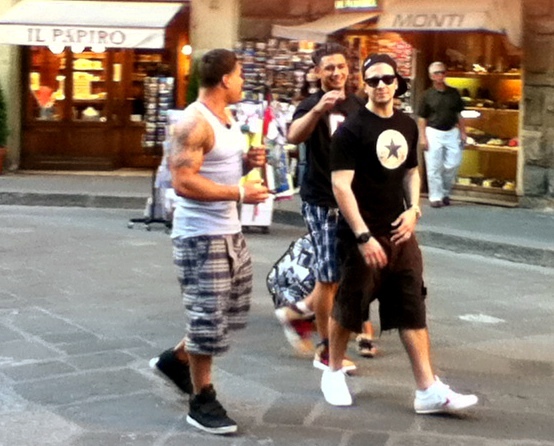 To follow in the footsteps of Snooki and Co., make your way north to Via de’ Cerretani where you will take a right. You will then take your first left on Via dei Conti. The road will bend to the left leading you to the south end of the leather market. Turn right into the market and follow it to the right as it bends around the Basilica of San Lorenzo. Turn left on Borgo la Noce which will lead you to a lovely little piazza with the world famous Trattoria Mario. But we’re not here to talk about authentic Italian culture! So instead look to your right to find the Lavanderia Manfredi where the cast washed their duds and dished their dirt. After you’ve given your clothes a spin in the same machines that the boys washed their Ed Hardy shirts and the girls tumble dried their push-up bras, head back to the Central Market. While here browse around just as our boy Ronnie did as he picked out, with the help of Jwoww, gifts for on-again-off-again girlfriend Sammi. Don’t worry though, somehow in one of the high fashion capitals of the world, Ronnie still managed to dig up accessories only a true Jersey girl could love. From the Mercato take Borgo San Lorenzo back to Piazza del Duomo to find the cast’s favorite day-drinking destination – Astor. The cafe/bar/nightclub is located on the north side of the Duomo and the beats bumpin’ from inside 24/7 makes it hard to miss. Burgers and iced coffees “to go” (definitely not an Italian concept) make this joint an American magnet for homesick college students during their semesters abroad. For the gang however, due to the proximity of their apartment and American atmosphere, Astor became a sort of refuge when they needed a hangover-curing mimosa or a quick fix when they got that mid afternoon party itch. Snooki in particular sought refuge at Astor when Jionni, her now fiance and baby daddy, left her high and dry in Florence. Instead of drowning herself in gelato, this guidette opted for a solo trip to Astor in the middle of the day for binge drinking and table dancing – I mean at least she got out of the house, right? For a “classier” establishment frequented by the cast, check out the nearby Caffè Duomo. This hangout was a cast favorite for hangover food, lunching, and most importantly – ragazzo hunting. Now it is no secret to any female in Florence that piquing the interest of an Italian male simply requires the possession of an additional x chromosome and a dash of eye contact. Single Deena, excited to have her very own Italian fling, put that extra x chromosome to use while at Caffè Duomo to pick up the cute caminiere – Elis. A few episodes later, satisfied with her exploration of foreign cultures, Deena decided that the Italian stallion maybe wasn’t her thing. If you are interested in helping heal Elis’ broken heart, he can still be found waiting on cute American girls at Caffè Duomo (it happened to be on the way to my apartment and I may have taken a few peeks – don’t judge). Enough with the lounging, let’s go see where the cast rolled up their sleeves, broke a sweat and put in an honest days “work.” I’m talking about the obligatory Jersey Shore place of employment – Pizzeria O’Vesuvio. To find O’Vesuvio walk south towards Piazza della Signoria. The pizzeria is located on Via dei Cimatori, the last little road before Piazza della Signoria. A flashing sign will draw you in to check out the restaurant for yourself. This once humble pizzeria is now an essential spot on the Jersey Shore pilgrimage and has dedicated itself to this clientele. Items of the cast’s signature clothing hang from a line in the middle of the restaurant creating a pseudo shrine of booty shorts, Dirty Couture t-shirts (from Pauly D’s very own clothing line) and glittered unmentionables. Although most people would shudder at the thought of Snooki’s underwear dangling above them as they dined, the dedicated Jersey Shore fans here don’t seem to mind. Check out photos of Pauly, Vinny, Ronnie, the Situation, Sammi, Deena, Jwoww, and Snooks putting in some serious elbow grease, such as the one seen below, featured in the O’Vesuvio photo gallery. ***Confession – I may or may not have demanded that my friends take me here on my birthday when the show was filming. Although the paperwork and agreements to sign before entering was extensive, the pizza was delicious and watching Snooki sneak beers to the bathroom made for a birthday I’ll never forget. While strolling down Via dei Cimatori you might as well look for the discrete entrance to Club TwentyOne. At this sacred spot Snooki’s boyfriend, Jionni, flipped out when Snooki got a little too crazypants. Legitimate concern, but Jionni, please, you know who you’re dating! That episode culminated in a drunk Snooki in 6-inch heels chasing a fuming Jionni down the street. As you could imagine things didn’t end well. Hysterical crying, stumbling, and the consultations from her BFF Jwoww ensued surely awakening all of residents of the formerly serene Via dei Cimatori. Although the gang spent many a day and night dining at Astor and Caffè Duomo, they occasionally had to acquire provisions to continue the Jersey Shore tradition of making Sunday dinner. As producers wanted to leave no corner of the city untainted, they woke up the quiet and peaceful Oltrarno by directing the gang across the Ponte Vecchio to the Coop supermercato. To check out the store where these guidos and guidettes fruitlessly attempted to translate food labels and pick out Italian ingredients, cross the Ponte Vecchio and take your first left. You will see the store on your right in about 10 seconds. Although it’s a bit of a hike, there’s no way that we could go without mentioning Piazza Michelangelo and the nightclub FLO. To reach Piazza Michelangelo from the Coop continue on Via dei Bardi all the way to Piazza San Niccolo. From here follow the masses and signs up to the Piazza. Our first stop once you’ve caught your breath at the top – FLO Nightclub. The outdoor discoteca hides from the masses as it sits just behind the southeast corner of the piazza. So why exactly is this club making our list above the rest? Because on one fated night the crew met Brittany and Erica – Florence’s “favorite” twin and a hysterical highlight of the season. To keep this blog PG I’ll stop there – just watch Twinning for yourself. Now I never thought in a million years that I would be club promoting on this blog BUT if you need somewhere to go shake out the sillies, this outdoor venue overlooking the twinkling lights of Florence is a great pick (and the icing on the cake – no cover!). The only hiccup – ever since the Jersey Shore christened the place with their wild night of “twinning,” the staff at FLO is apprehensive at best about letting Americans into the typically locals-only nightclub. Before descending from the Piazza, grab a seat at one of the cafes with your best pals just as the cast did on their last night in the city. A few fist fights, break-ups, make-ups, broken wine-bottles and pranks later, the cast found themselves overlooking the sunset on Firenze and season 4 right back where they started – as a family. Were Florentines happy when these troublemakers returned to Jersey? Definitely. But when all is said and done, I think we all have a soft spot for the Jersey Shore somewhere deep down – even the Italians who now sell “palestra, tintarella, lavandaria” (GTL) t-shirts. There it is, everything you secretly wanted to know about the Jersey Shore in Florence but were too afraid to ask. Don’t worry, we won’t tell that you read this, but we’re happy that you did. Because your guilty pleasure is ours too. Hi! Thank you for this article . Do you know where Sammy and Ron went for their rooftop romantic dinner ?